So I found this little musing on Tumblr, land of opinions, about the shipping of the non-canon, non-gay men characters on Sherlock. Cantpronounce is “still struggling to understand why” straight women shipping two men together is seen as fetishizing homosexuality. 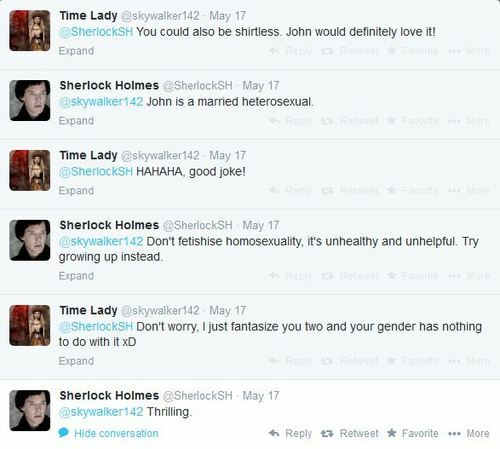 Disclaimer, I know nothing about Johnlock, but this entitlement some straight people feel about LGBT characters is hardly unique to Sherlock. (Klainers, I’m looking at you) and hardly unique to women (straight dudes, queer women don’t exist for your gratification.) What I do understand; however, is why some LGBT people (and those allies who get it) have a hard time with straight people appropriating queer characters as their talisman for being mistreated by showrunners, writers or whoever, for shipping same gender couples.